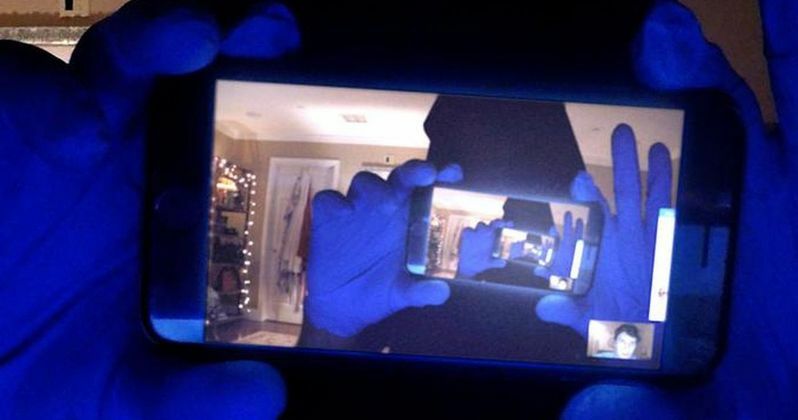 Blumhouse surprised SXSW audiences with a sequel to 2014's Unfriended. Though, it's really only a sequel in name and general concept, as Unfriended: Dark Web has virtually no connective tissue to its predecessor and is a very different type of movie. It has new characters and a new framing device that brings some invention and refreshing ideas to the horror genre. There are some challenging and gripping concepts explored here, but the movie, overall, just doesn't manage to get there. Unfriended: Dark Web centers on a 20-something who finds a cache of hidden files on his new laptop while playing a game night over Skype with some of his friends. These files, and the laptop for that matter, are a lot more than what they seem, which thrusts this unsuspecting group of friends into the deep waters of the dark web. The movie unravels in real-time, entirely on a computer screen, much like the first Unfriended, but this movie is a lot more than just a gimmick. It's a truly brutal and bleak look at just how terrifying the digital age can be. Stephen Susco, writer of The Grudge, makes his directorial debut with Unfriended: Dark Web, taking over for Levan Gabriadze, who helmed the first entry in the franchise. While this certainly isn't a movie that winds up being wholly satisfying for a handful of reasons, it feels like a better directed movie in many ways and Susco definitely is a guy I want to see direct more. That's a credit to the movie. The inventive and clever stuff that does work here is equally compelling and unsettling, in the way that good horror can be unsettling and a lot of that is thanks to the direction and vision Susco had for this movie. This movie doesn't really rely on a bunch of cheap jump scares as one might expect. There are a few in there, but it really builds on a general sense of dread and has an underlying, terrifying idea that gets inside the viewers head. We all use the internet on a day-to-day basis now to the point that it's just a ubiquitous part of our lives. But there are people out there who can and do use the internet as a tool for evil and Unfriended: Dark Web plays with that idea, but takes it to its absolute extreme. It's effectively scary in a broad way and it's something you'll leave the theater still thinking about. There's almost no question about that. In that sense, the movie is impactful. It works on that level. The possible issue is that dealing with subject matter such as this might benefit from some sort of commentary on it. I'm certain there was some intent in that respect, but it's not clear as presented. It's just presenting this terrifying thing and not commenting on it. This awful scenario just presents itself to a group of mostly good people who become unsuspecting victims. There's no optimism in it or comment on how people can deal with things like this. There doesn't seem to be much to say about it other than like, "Hey guys, isn't this messed up and horrifying?" At best, the lessons here are to put some tape over your webcam and don't take things that don't belong to you. Another element that can either work to this movie's benefit or its detriment, depending on your view, is that it's really bleak. This is a terribly dark, seedy and cruel movie that doesn't offer much in the way of hope. It's far more cruel in its overall messaged than the first Unfriended was. It's brutal in that way and unrelentingly dour. It kind of leaves the viewer with this overall scummy feeling and there's no way to wash it off. Unfriended: Dark Web wanders down a very seedy road and explores the cruel nature of that road fully and thoroughly. It's committed on that level. This is a movie that winds up being something of a mixed bag. It's not as outwardly entertaining as the first Unfriended, but it's also more bold, inventive and risky. It's just that there isn't the pay off that one wants with that kind of audacious storytelling. Still, it's surprising that a movie that takes place entirely on a laptop screen in video chat windows works at all and can be inventive beyond its gimmick. It's a strange combination of admirable yet kind of unsatisfying as a whole. Blumhouse's Unfriended: Dark Web, if nothing else, does make you think and isn't just a lazy, predictable sequel.